On the 11th hour of the 11th day of the 11th month, in the year 1918, “The Great War” ended. Of course, it couldn’t have been known as “World War I” at the time — because that would mean the insanity of wholesale slaughter and wanton destruction would happen again. What a difference a generation makes…. 92 years after the poppy has come to signify remembrance of those who fell in defense of the State, whether in Flanders Fields or France or the coral atolls of the Pacific or the rolling hills of Korea or the jungles of Vietnam or the deserts of Iraq or the river valleys of the Hindu Kush, today we are living off the interest earned by their blood. 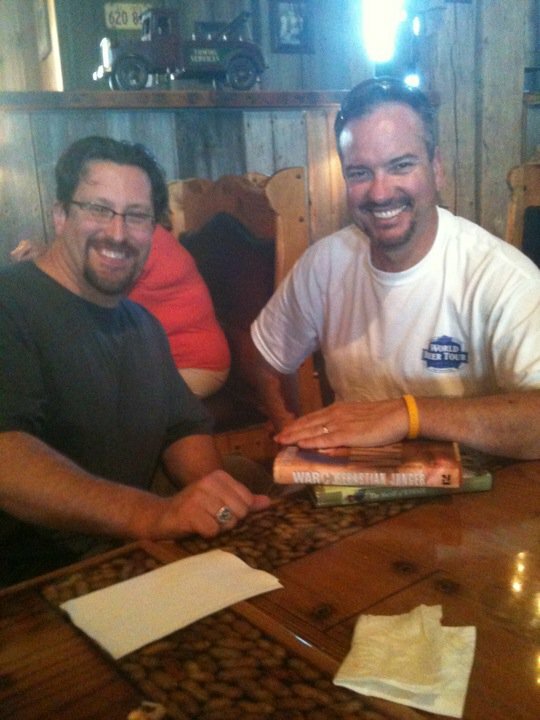 Earlier today, my friend and sometime co–author Shane Deichman, who blogs at Wizards of Oz, passed through the area as part of his “OldSkool 2010“ tour. Mrs. Zenpundit and I were treated to lunch by the Deichmans and it was a pleasure to see them and their children, including their adorable youngest member of the family, who was not yet born the last time we got together. Food was good, the company was better! Nearly 25 years ago, as a freshman college student balancing a science major with the obligatory credits in the Humanities, my English 101 professor introduced me to the concept of “verisimilitude“: the likeness or resemblance of a creative writing effort to reality. 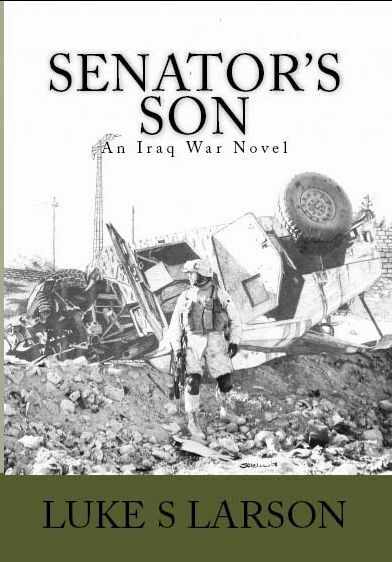 While this was a difficult feat for me in my writing assignments, it is something that Luke Larson has effortlessly achieved in his first novel, Senator’s Son. Luke was a journalism major at a rival PAC-10 school, courtesy of an NROTC scholarship to the University of Arizona, and as a junior officer in the U.S. Marine Corps served two tours in Iraq (both in al Anbar province – first in 2005 during the election of the Iraqi Transitional Government that was to draft a permanent constitution, and again in 2007 during the Iraqi national referendum and the start of General Petraeus’s “Surge”). Senator’s Son wastes no time hurling the reader into the breech. Written in a tempo prestissimo style, this rapid-fire novel gives you a no-holds-barred perspective of modern counterinsurgency from multiple perspectives: the families at home with a dissociated populace; the wounded warriors battling the demons of recovery, opiate pain-killer addictions and Post-Traumatic Stress Disorder; the careerist bureaucrats that infiltrate every large organization; and most importantly the junior officers and non-commissioned officers who must make up for “higher’s” planning inadequacies and strategic myopia. Larson’s use of a 2047 scenario in the southwest Pacific, with a lone Senator holding the deciding vote on whether or not to commit U.S. military power abroad, helps to reinforce the strategic consequences our actions today can have on future generations. Set in 2007 Ar Ramadi, a city of nearly a half-million that serves as the provincial capital of al Anbar province just west of Baghdad, Senator’s Son is the story of the platoons of GOLF Company. GOLF is a Marine company (part of a Marine battalion tied to an Army brigade) responsible for sweeping missions in south Ramadi in the days prior to the 2007 Iraqi national referendum (and a few months prior to “The Surge”). Their early ventures from the “Snake Pit” (a heavily fortified Marine firm base) poignantly demonstrate the complexities of contemporary warfare. The force protection concerns are palpable – one can almost smell the raw sewage flowing through the ruined streets of a dying city, and feel the peering eyes of snipers tracking you in their sights. Every piece of litter is a potential Improvised Explosive Device, and every sound a threat. And like Mayor Giuliani’s “Broken Windows” theory in late 1990s New York City, the reluctant shift from a hardened, up-armored patrol mindset to one of cooperative engagement with a foreign culture underscores the essence of counterinsurgency (COIN) doctrine now codified in FM 3-24/MCWP 3-33.5: Counterinsurgency. Like real life, there are few “happy endings” in this book. Each platoon commander in GOLF has his own strengths and fallibilities: from steadfast Bama’s bravery and bigotries to the maverick Greg’s ingenuity and independence. And each must face his own demons in the prose that Larson deftly weaves. At a minimum, Senator’s Son is a brilliant primer on leadership: how to learn which rules are worth breaking, the importance of adaptability when there are no black-or-white situations but only gray, and the primacy of relationships. But it is also a tribute to those who answer a call to serve – whether they serve in their own communities as volunteers, or have the privilege of wearing the Eagle-Globe-and-Anchor of a Marine (like my grandfather, a mortarman with CHARLIE-1-6 in Guadalcanal and Tarawa, and my grandmother, a clerk-typist at Hunters Point-San Francisco who met my grandfather after his malaria washed him out of the Fleet Marine Force). Senator’s Son is a testament to the resilience of those who carry the burden of personal sacrifice with such humility that we can take our own freedom for granted. This book is a “must read” for anyone who cares about the greater world beyond our neighborhood – and the role that power (be it the “hard” power of weaponry and kinetic energy, or the “soft” power of relationships) can play in shaping the world for better or for worse. In this book, Admiral of the Fleet Gorshkov not only offers a vision of the relevance of the “World Ocean” to any nation’s well-being – he also provides a compelling rationale for “joint operations” a full ten years before our own nation’s Goldwater-Nichols Act forced jointness onto a reluctant American defense establishment, and underscores the importance of the littoral in a navy’s ability to influencing events ashore nearly two decades before “… From the Sea”. I am not an expert in maritime matters but I am relatively conversant on Soviet affairs. Shane’s right, by Soviet standards, where bureaucratic conservatism and enforced conformity to CPSU doctrine served to weed out independent thinkers before they could ascend the first rungs of the nomenklatura ladder, Gorshakov was making a daring, even a startingly bold argument. The Sea Power of the State could have easily been a career-ender had the ideological winds taken a wrong turn; Gorshakov’s argument has very little to do with Marxism or Soviet military doctrine. Instead, it draws upon the Petrine tradition of modernization and securing the “window to the west” that Peter the Great sought in building St. Petersburg and the warm water ports after which subsequent Tsars lusted. ….In the early 1960s, President Kennedy charged his Science Advisory Committee (chaired by Dr. Jerome Wiesner, Special Assistant to the President on Science and Technology) to charter a panel to review federal information management policies and practices. The “Panel on Science Information” was chaired by Dr. Alvin M. Weinberg, Director of Oak Ridge National Lab (ORNL). ORNL is the site of the world’s first operational nuclear reactor (the Graphite Reactor, where the “pile” from the University of Chicago was moved during World War II to validate the “breeder reactor” concept) and a key national laboratory. At the other extreme, the Department of Defense was singled out in the Weinberg Report for having an information agency (Armed Services Technical Information Agency [ASTIA], predecessor of today’s Defense Technical Information Center [DTIC]) that only handled internal reports and internal information retrieval requests. In the spirit of engaging and informing the American public of what the government does and why, Shane Deichman of Wizard of Oz and deep thinker on S&T sent along this post on Openness & Government. He is also the blogger increasingly pictured drinking with fellow bloggers.